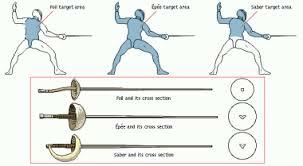 Classical Fencing is the practice of fencing with foil, sabre and epee as they were fenced prior to the introduction of the electric scoring apparatus. 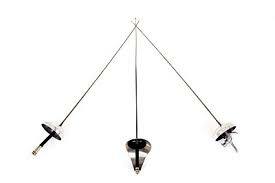 Classical fencing is the continuation of an unbroken line of study of the art of defense reaching back for centuries. Its origins emerge from the duel, but it has no end date, any more than classical music has an end date. Modern electric fencing is simply a continuation of that tradition on a slightly different path. 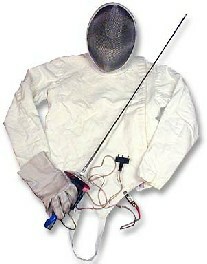 Other than the lack of electricity (sometimes referred to as “Dry” fencing), the thing that sets classical fencing apart from it’s modern (Olympic) counterpart is form and technique. 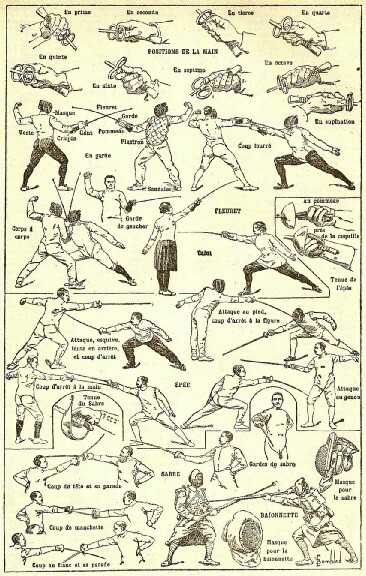 While some of this is anachronistic (picture John L. Sullivan’s boxing style), most is still relevant, even in the modern sport fencing world. As the use of electricity separates classical fencing from sport fencing, the continuity of study separates Historical Fencing from classical. 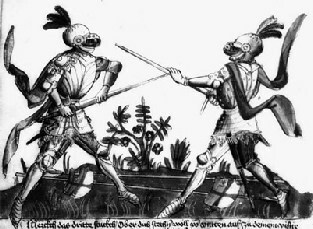 While I enjoy fencing with the two handed sword, rapier, shortsword, longsword, two-weapons (florentine), cutlass, dueling sabre, sword and shield, etc.,etc., I consider these weapons to be historical rather than classical because the use of them requires the study and, sometimes, translation of old, somewhat forgotten, texts. The Masters are gone and the only way we have of understanding the nuances of these weapons is to recreate the teachings from what they left behind. There is a trick about Theatrical Fencing, which depending on your audience, can be very difficult. More akin to the art of illusion, the differences are sometimes hidden while the theory remains the same. Similar to scoring points and drawing blood, is drawing applause. Making the “Coup de Grace” seem like the real thing is impossible if the viewer thinks the actors are dancing rather than phrasing with all of their effort. Safe choreography does not have to be boring, just convincing. In the end it all comes down to knowledge. Knowing the tiny details, understanding the theory and proper implementation can literally involve the audience in the actions performed on stage and leave them gasping in aw. The best way to begin is to start. However the mood takes you, stop dreaming about flourishing against uncommon odds and pick up a stick, hold it, swing it, twirl it, just don’t hit anything or anybody! 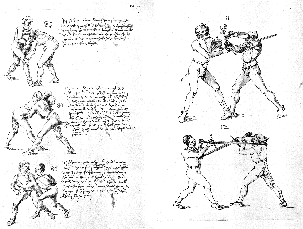 Grab a book (if you are inclined) and read how to do the basic stances, thrusts and parries. Practice in the backyard or in front of a mirror to check yourself. Match what you see in the pictures. The important part is to become use to some form of action that you can convince yourself feels good and that you do not look foolish. To others you do look foolish, but they do not matter, get into your own mind and stay there. When the fun of the fantasy play starts to fade, find someone to play with. The Society for Creative Anachronism is a great place to start. A member of the society can make their own arms and armor, can duel and spar one-on-one in practice or in tournaments and get the chance to be in the middle of a medieval war with dozens or hundreds or even thousands on either side of the battlefield. The range of historical weapons to use and the unassuming nature of the groups provides an excellent place to find interesting and informative people that have a passion for the use of the sword. 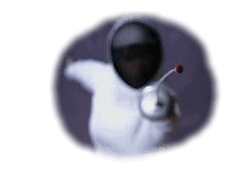 If you are lucky enough to have a classical fencing club in your area, take advantage of what they offer. Every instructor has a different spin on their teachings, none of us agree on the perfect lesson but in the end knowledge will be gained. Don’t sweat it if you don’t get along with the coach or some other personality in the class, fencing is a personal matter the only real competition is yourself. I lent most of them out so I’m getting them together now.